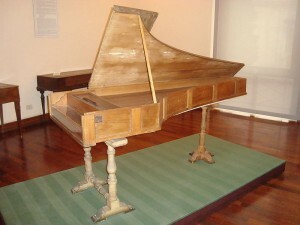 The first pianoforte was built by Cristofori in Florence in the years directly leading up to 1700. 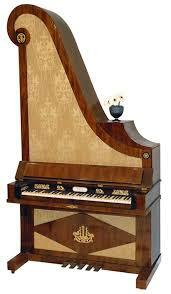 Cristofori’s instrument was called a “gravicembalo col piano e forte” (harpsichord with soft and loud). 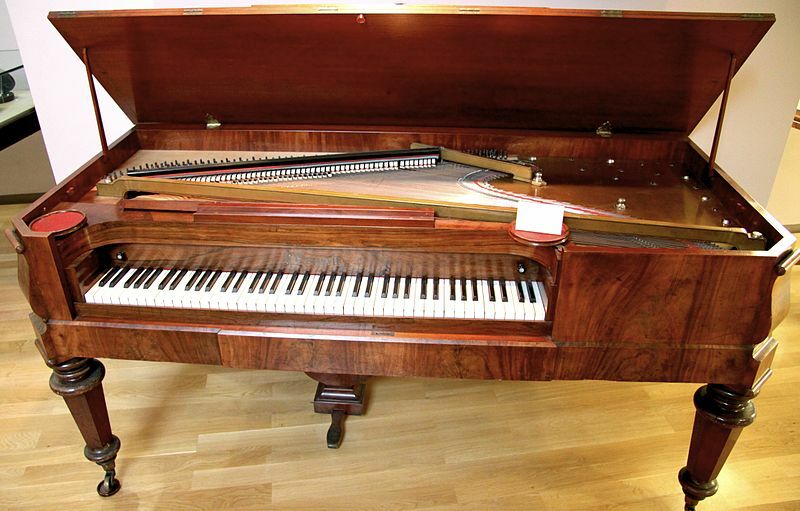 By substituting the plucking action of the harpsichord to vibrate the strings with a hammer action, Cristofori was able to give the performer the choice whether the instrument would sound quietly (a gentle touch on the keys) or loudly (a strong touch on the keys). Hence the name pianoforte was born. The early pianos, however, took several decades to establish themselves and took the name fortepiano as often as pianoforte. J.S.Bach played on several instruments while visiting the court of Frederick the Great in Berlin and was not impressed by them. To hear music of CPE Bach, JS bach’s eldest son, listen to the recording under “Empfindsamer Stil” on the Classical Period background page. It was not until the early Classical period that the piano’s potential and the musical style of the day became became united. With the expression of contrasting and complementary emotions in the music, the various gradations in volume and touch possible on the piano became indispensible to artistic expression. In the early 1770s, the “square” piano (‘desk’-, rather than ‘wing’-shaped) was invented. This had the advantage of compactness and proved to be the ideal ‘domestic’ instrument for the growing middle class population in Europe. Soon a new market for both music and instruments, as well as public performances evolved. The invention of the upright piano (1800) and the iron frame (1835) all ensured the dominance of the piano as the core instrument of western music for the next 200 Years and heralded in the age of ROMANTICISM in music. In the Baroque period the Sonata was mostly written for a combination of instruments – 1 (or 2) melody instruments (violin, oboe, flute etc.) supported by a bass instrument (e.g. cello,bassoon) and a chord playing instrument (e.g. harpsichord, lute). In the Classical period these combinations were modified in parallel with the artistic changes of the time to an ensemble of three (violin, cello and piano – the Piano Trio) or even two (e.g. violin and piano – the Violin Sonata). However, with the rise of the piano as an instrument of touch sensitivity and full harmonic and melodic potential, a new type of form grew – the sonata for pianoforte solo. Towards the end of the 18th century this form became the most important way for composers to experiment with new musical ideas before risking the investment of time and money necessary to produce their more extrovert symphonies for full orchestra. Haydn wrote 52 piano sonatas, Mozart 17 and Beethoven 32. While the Classical symphony usually had 4 movements: Allegro (occasionally with a short Adagio introduction), Andante, Minuet and Trio, Allegro finale – the sonata usually had only three movements. The dance-like Minuet and Trio movement was most frequently omitted. The three movements of the Classical sonata are also characterised by the way the music is structured in each movement: 1st movement in sonata form (not to be confused with the term sonata, for all 3 movements), 2nd movement either in sonata- or variation form (sometimes a mixture of both), finale in rondo- or sonata form. Mozart’s Sonata in C for pianoforte, KV 309 follows this pattern: A sonata form Allegro, then an Adagio movement which is a mixture of variation and rondo forms and finally another Allegro, a mixture of rondo and sonata form.